Last week we talked about how to prevent procurement fraud, and this week we’re talking about how to identify procurement fraud. According to the Grant Thornton whitepaper “Construction Fraud in Canada,” there are ten ways of identifying procurement fraud. But before we begin, we’d like to clarify that procurement fraud is a significant part of construction fraud. One: Delaying or not paying for projects. This also includes using leftover cash to pay for other projects. Two: Overstating the size of a project to acquire more funding and resources. Three: Saying you’ve used more or less of a particular item than you actually have. For instance, if I worked in construction; I might say I’ve used 20 LBS of concrete when I’ve actually only used 10 LBS. Four: Trying to change a project budget from a lump-sum payment to a pay-as-you-go method. Rather than getting paid all at once to remodel your house, I may want to get paid throughout the process. Which would make it easier to lie about the budget for you. Five: Substituting or removing material from a project site. This is really bad because I can take your materials, sell it for more, and replace your site with cheaper materials. Six: Changing project scope by omitting information or removing descriptions. Seven: Using company money to buy personal items or funnelling money to fake accounts. 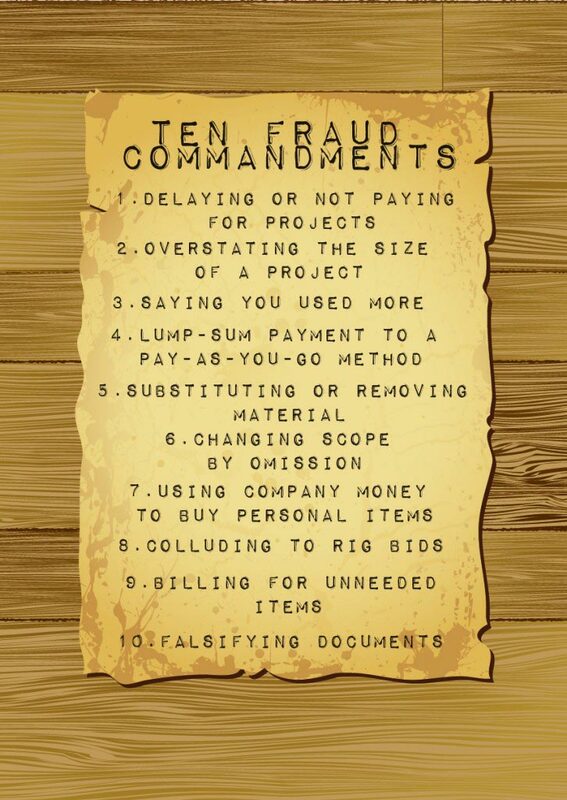 Eight: Subcontractors colluding to rig project bids, give bribes, create kickbacks and inflate charges. Nine: Billing for unneeded tools and removing equipment from a project site. Ten: Falsified documents such as environmental or insurance certificates. The average loss procurement and construction fraud in Canada is higher than the global average; It’s more than $600,000 per year. That’s a$#&! ton of money. So moral of the story is you need to identify procurement fraud to be able to prevent it.